Can I erase sensitive data on an old hard drive with Neodymium Magnets? Can I use strong neodymium magnets to erase the files off my old hard drive? How big does the magnet need to be? How can I be sure that the data is erased? Read more to learn about our surprising experimental results. Neodymium magnets can erase credit cards and VHS tapes. The strong magnetic fields produced by these magnets is enough to erase or scramble the data. Since hard drives also store their data on magnetic media, you would expect similar results. 30 Gb Hard Drive continuously reading files with no errors, with two strong DX0X8 magnets. To simplify the experiment, we chose not to try destroying the data on a hard drive where the operating system was running. We ran the computer entirely from the CD drive with DSL, a small Linux operating system. That way, we would be able to measure the amount of data that was scrambled, since our operating system would still work. We filled an old IBM, 30Gb, 7200 RPM, IDE hard drive with thousands of copies of a text file, with the same line of text repeated a many times. A small script was run that looped through all those files, checking the contents of each individual line. While this was running, we stuck magnets to the hard drive. Different sizes were used, ranging from tiny D41 discs to huge 2" RY04Y0DIA magnets. As shown in the picture, the magnets were placed at the top of the spinning disc, well away from the read-head. We wanted to avoid causing any physical damage to the hard drive by bending/dragging the read head across it. After the data was scrambled, we still wanted an operable hard drive to confirm that the data was really gone. With the hard drive running, we were not able to disrupt the contents of the drive at all. 100% of the files were completely intact and accurate. This result completely surprised us! We were definitely getting some magnetic influence inside the drive. When strong magnets like our RY04Y0DIA were held close, we could hear mechanical rubbing sounds from the drive, likely the result of deflection of the platters. We didn't go much larger with the drive running, for fear of rendering the drive inoperable by mechanically bending parts inside. The simulation picture at right shows our pair of DX0X8 magnets on either side of the disc platters. This pair was chosen based on some studies of what arrangements would produce the strongest field within the drive. We hoped that we might be able to at least affect the outermost platters, even if the inner ones might be shielded by them. Most of the instructions we've seen say to rub the magnet several times across the face of the drive. With our arrangement, the drive is actually spinning at 7,200 RPM. We're pretty sure it's passing over the drive multiple times! We also rubbed some very large magnets, like our 3" diameter DZ0X8-N52, across the hard drive with the drive turned off. We figured we could use these large magnets without causing mechanical damage when it wasn't running. When re-checked, the drive still showed no errors! None of the data was changed at all. Why didn't this work? Surely these incredible magnets are strong enough! Some older types of magnetic storage media can be erased with neodymium magnets. The magnetic stripe on your credit card is one example. Audio cassettes and VHS video tapes are another. 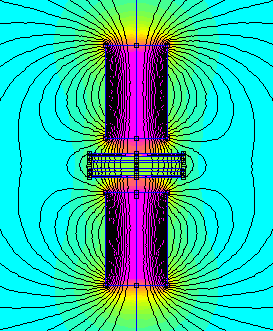 The material's coercivity, or resistance to being demagnetized, is lower than the field made by the magnet. You can look up the coercivity numbers for these materials, all of which are usually in the 500-1000 Oersted range. The more we researched the topic, the more we found conflicting data on the coercivity of hard drive materials. One source said 1,250 Oe, another said 2,500 Oe. It seems that, in the race to make hard drives of greater storage capacities, hard drive manufacturers keep finding higher coercivity materials for the hard drive platters. The later the manufacturing date of your hard drive, probably the higher the drive's coercivity will be. We searched for hard drive erasing services, figuring we could learn something by finding out what such companies provide. Most companies either use strong degaussing machines that produce a strong an alternating magnetic field with an electromagnet, or shredders to physically destroy the drive. As hard drive coercivity improves, physical destruction is becoming the more popular method. We didn't try every possible combination of magnet and erasure method. Since our methods failed to alter a single character of a single file, though, we wouldn't trust it to delete ALL the data. Our results make us doubt that neodymium magnets are sure to erase all the data. 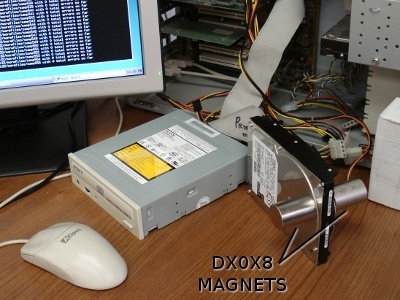 When folks rub a magnet across a hard drive, the goal is 100% data erasure. If you have a proven method that works for you, we'd love to hear about it. Darik's Boot and Nuke - A bootable CD that finds all connected hard drives and erases them. A dangerous disk to have laying around. Eraser - Free, open source software. KillDisk - Offers a free version and one you can purchase. If the drive is not operational, you can't run any of these software packages on it. Physical destruction is probably your best option. Government agencies often use shredders to accomplish this. A do-it-yourself favorite is to make many holes through the drive with a drill press. 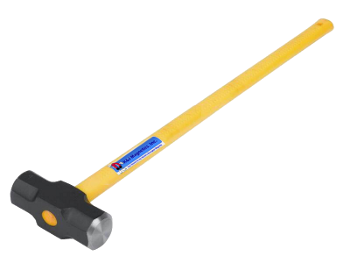 Please wear safety glasses when following these instructions: Apply sledgehammer. Repeat. Please note that this article describes our investigation about using magnets to completely erase data on a hard drive. It completely ignores the question of whether a strong magnet can DAMAGE a hard drive. These strong magnets certainly can damage a hard drive if brought close enough. Keep neodymium magnets away from good hard drives!